I'm after a bit of advice about these. I understand I will need to wire in an ecu to make the td5 work, but which one will I need? Is the ECM another name for the engine ecu, or is it another box I will need? Are there any other ecu's I will need to make this work? You'll need a Td5 ECU from a Defender. Ideally you would get the one that went with the engine you've obtained as that would save you re-coding the injectors etc. but that can be worked around reasonably easily with a Nanocom etc. As far as I'm aware ECM means engine control module, ie. another name for ECU. You'll probably want the 10AS alarm ECU as well, this gives you the immobiliser function as well as potentially central locking control and all. The Td5 engines can be made to run without the 10AS but I wouldn't turn down the extra security element (even if they are not that secure by any means!). I'd just buy a full Td5 vehicle loom off a Defender, complete with ECUs and all, that way everything is stock and as Land Rover intended when they made the Td5 Defenders! Should be a case of plug-and-play then, save for any re-programming of the ECU and 10AS that might be required as above. The Td5 chassis and wing looms should fit your lights without issue, and the chassis one will have provision in for the fuel pump which you'll need to sort in the rear tank. Won't it need a hookup to the autobox? My 2001 TD5 Defender [manual] has a circuit that tells the ECU whether I am in high or low ratio on the transfer-box, and I'd imagine a slushbox needs some similar feedback to the ECU to control the torque at the instant the autobox is changing-ratios. "Badgers are always part of the problem and never part of the solution". Defenders never had a Td5 and an autobox, they do have a high/low range sensor though as you say. I wouldn't have thought the engine would need a feed from the box. If you wanted to implement that you would have to use a Discovery II autobox which would presumably be electronically controlled and linked to the engine. The 10AS alarm ecu is a good idea, so will look for one on ebay. 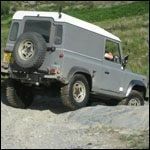 Ashcroft say the 300tdi disco 1 auto box will work. The disco 2 box would need their compushift system to make it work £££££££! I read on one of the forums the other day that you just need to short out the sensor circuit. The throttle only opens half way for a full pedal in low ratio. In high it's full throttle, full pedal. That way you get better control in low box. Working on that it must just use the High/Low switch that works the light.